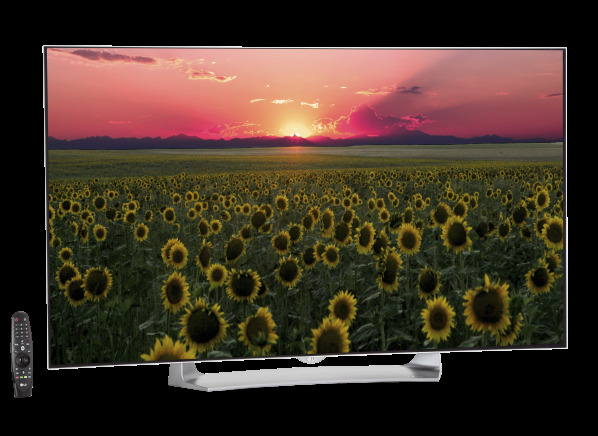 The LG 55EG9100 is a 55-inch OLED HDTV with a native resolution of 1920x1080 (1080p). This TV has a 3D mode that requires the use of special glasses to see three-dimensional images. This model is Internet-enabled and can access online content, including streaming movie and TV services. It has an Ethernet jack for a wired connection to your home network via a cable. This TV is also Wi-Fi capable, so you can connect it to your home network wirelessly. It is DLNA certified, so you can view digital photos stored on a compatible computer, phone, or other mobile device also connected to your home network. This set has 3 HDMI inputs and 1 component-video inputs, which also doubles as a composite-video input. It also has 3 USB ports, which may be used to play media--photos, videos, and music--stored on a flash drive. The warranty on this TV covers parts/labor for 12/12 months, respectively. Results in the following chart are gathered from Consumer Reports’ 2018 Winter Survey of 97,554 TVs owned by members who purchased a new set between 2010 and 2018. Our predicted reliability ratings are based on a statistical model that estimates problem rates within the first 5 years of ownership, for TVs that are not covered by an extended warranty or service contract. Higher ratings are indicative of better reliability. Brands receiving a red or orange rating cannot be recommended by CR at this time. Our owner satisfaction ratings are based on the proportion of members who are extremely likely to recommend their TV to friends and family. HDMI input HDMI input The total number of HDMI inputs on the TV. HDMI (High-Definition Multimedia Interface) is a digital audio/video connection found on TVs, monitors, Blu-ray players, DVD players, receivers, media players, cameras and digital TV tuners. HDMI is the preferred type of A/V connection between TV and device, over an analog component, composite, or RF (such as from a cable box). Component-video Component-video The total number of component-video inputs on the TV. Component-video is a high quality analog video connection that can accept high definition 1080i/p or 720p, or standard definition 480i/p. Component-video connections require three separate RCA jacks. Component/Composite-video shared inputs Component/Composite-video shared inputs Component/Composite-video shared inputs (total/aux). One of the three component video input RCA jacks doubles as a composite-video input. This means you can only plug in one type or the other at any given time. Composite-video Composite-video Number of composite-video inputs on the TV. A composite video signal is analog, and carries standard definition (480i) video only, no audio. Composite is often used to connect older equipment like a VCR, or older camera and camcorder models, to your TV. USB port USB port USB port lets you connect a flash drive for playback of multimedia content such as videos, photos, and music. VGA input VGA input VGA (Video Graphics Array) connector is essentially a standard connection for video on computers and monitors, and becoming less common on high-definition TVs, in favor of an HDMI connection. This type of input is no longer available on most TVs. Ethernet port Ethernet port Ethernet is the common wired network connection that allows TVs to access to the Internet. TVs with an Ethernet port typically have WiFi capability as well, but a wired connection is generally considered more reliable. Digital-audio output Digital-audio output The TV comes with either a coaxial or optical digital-audio output to let you route the audio soundtrack to an external receiver. The receiver thus splits apart the soundtrack for distribution to various speakers in the room. Headphone jack (3.5mm audio jack) Headphone jack (3.5mm audio jack) When you want to watch TV without disturbing others, a headphone jack (usually on the front or side of the set) lets you plug in headphones via a stereo mini jack. You are more likely to find this feature on smaller screen TVs. Frame rate (Hz) Frame rate Frame rate indicates the manufacturer's claim of how often a TV refreshes its picture in a second. WiFi WiFi Allows your TV to connect to the Internet or to a home network without the use of a wired Ethernet connection. Web browser Web browser Offers full web browsing capability. DLNA-certified DLNA-certified DLNA-enabled devices can send digitally stored content like music, pictures, and videos over a home network connection--wireless or wired--from a storage device to a player, display, or another storage device. The devices can include a computer, TV, DVR, set-top box, printer, and cell phone. Number of 3D glasses included Number of 3D glasses included The number of special 3D eyeglasses included with the 3D TV. Some 3D TVs omit this item to control costs. Some 3D Blu-ray players may include these glasses. Retailers may offer a "3D TV + Blu-ray" bundle that also includes the glasses. All of the 3DTVs in our Ratings require the viewer to don special eyeglasses. So-called "active" 3D sets, which require "active" battery-powered LCD shutter glasses, may come with one or more pairs, or none. Additional pairs generally cost from $50 to $150 each. Most so-called "passive" 3D TVs come with four pairs of passive polarized glasses, much like the ones used in theaters, which don't require batteries. Additional sets cost from $10 to $30 each. You cannot use passive glasses with 3DTV that requires active glasses, and vice-versa. You also generally cannot mix active 3D glasses from one brand of TV with another's, though TVs made in 2012 and later may share glasses. (Passive 3D glasses can be used interchangeably with any passive 3D TVs.) There are some "universal" active 3D glasses you can buy as an after-market item . 3D type 3D type 3D TVs use either "Passive" or "Active" technology to present 3D. Passive type TVs typically have a brighter picture but reduced image resolution (except on UHD TVs). Active systems typically present 3D at full screen resolution but image brightness is lower than when viewing programs in regular 2D. Active 3D TVs now use very light weight 3D glasses, comparable to those for Passive TVs. 3D-capable 3D-capable A 3D-capable display can -- when fed a proper 3D signal and used with other required 3D equipment, such as 3D glasses--provide a strong illusion of three-dimensionality. When in the 3D mode, the TV displays double images, which are resolved into a single 3D image when viewed using the 3D glasses, which sync to the TV. A 3D TV operates as a standard HDTV when presented with normal 2D programs, which are viewed without glasses. Due to recent standards, active 3D glasses made for one manufacturer's TV may work with another brand TV. Some 3D TVs may come with several sets of 3D glasses, while others may come with none. To view prerecorded 3D movies, you'll need a 3D-capable Blu-ray player. Some settop boxes from cable and satellite companies are also capable of sending a 3D signal to the TV, though the resolution is less than that provided by a 3D Blu-ray player. Native resolution Native resolution Applies to "fixed-pixel" display types such as LCD (LED), OLED. Native resolution is expressed in horizontal by vertical pixels (for example: 1920x1080 for an HD display). Overall height (in.) Overall height The height of the TV in inches, rounded up to the nearest 0.25-inch. Dimensions include the base and detachable speakers, important if you plan to place the TV on a stand or in an entertainment center. See "Panel size without base" if you plan to wall-mount only the display. Overall width (in.) Overall width The width of the TV in inches, rounded up to the nearest 0.25-inch. Dimensions include the base and detachable speakers, important if you plan to place the TV on a stand or in an entertainment center. See "Panel size without base" if you plan to wall-mount only the display. Overall depth (in.) (in.) Overall depth (in.) The depth of the TV in inches, rounded up to the nearest 0.25-inch. Dimensions include the base and detachable speakers, important if you plan to place the TV on a stand or in an entertainment center. See "Panel size without base" if you plan to wall-mount only the display. Screen shape (aspect ratio) Screen shape (aspect ratio) The screen shape, or aspect ratio, is the proportion of a TV screen's width to its height. Current HD and UHD TVs have a wide, “16:9” aspect ratio, unlike older tube TVs screens with an aspect ratio of "4:3," giving them a squarish shape. Digital Tuner (Off-air ATSC and Cable QAM) Digital Tuner (Off-air ATSC and Cable QAM) An ATSC tuner can receive free over-the-air local broadcast digital signals, which may include high-definition widescreen images and multi-channel sound. All HDTVs and Ultra HD TVs have a built-in ATSC tuner that only require a VHF/UHF indoor or a roof antenna to receive the broadcast networks' high-definition (HD), or standard-definition (SD) program offerings. You must be close enough to a station transmitter, with few obstructions blocking the signal, in order for the TV to pick up the channels. Also note that you won't get any of the premium channels typically offered only on cable or satellite. Panel size without base HxWxD (in.) Panel size without base HxWxD For flat-panel LCD and OLED sets, dimensions are for the display panel only, not including the base and detachable speakers, rounded up to the nearest 0.25-inch; also see "Overall height (in. )", "Overall width (in. )", and "Overall depth (in.)". Weight including base (lb.) Weight including base How much the television weighs (in pounds). Warranty (months): parts/labor Warranty (months): parts/labor The length of time the product is covered by its manufacturer for defects or repairs. Warranty coverage is often divided into parts and labor. Twelve months for both is typical. Warranty (months): parts/labor/in-home Warranty (months): parts/labor/in-home The length of time the product is covered by its manufacturer for defects or repairs. Warranty coverage is often divided into parts and labor. Twelve months for both is typical. With an in-home warranty, a technician comes to your home to service the set when you have a problem -- of particular importance with heavy or wall-mounted sets. Screen finish Screen finish The reflectivity of the display's surface. A screen with a mirror-like, or glossy finish may introduce distracting reflections from nearby lighting or windows. A matte screen is better for reducing glare in rooms with many lights, but these are not typically found on displays larger than 32".